SBI PO 2019: SBI(State Bank of India) has been released the Official Notification for the post of PO (Probationary Officer), the exam is conducted by the SBI in every year, there are total number of 2000 vacancies have been announced by SBI this year, PO is one of the most dreamed job for millions of the banking aspirants, the notification is released on 21st April 2018 and last date of filling the application form is 13th May 2018, the recruitment process of the exam consists of 3 stages- i.e Phase I – Prelims, Phase II – Mains and Phase III – Group Exercise & Interview. 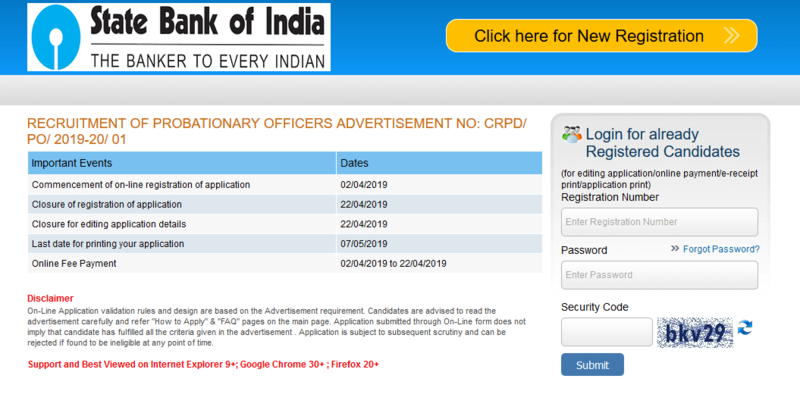 SBI PO 2019 Official notification has been released now, Click Here to Check Official Notification. SBI PO Application Form Link has been activated now, Click Here to Apply Online. Best books for SBI PO. Best books for SBI Clerk. The SBI PO 2019 Application Form has been released now, Candidates can fill the Online Application Form from 2nd April 2019 to 22nd April 2019, and Candidates can pay the application fee till 22nd April 2019. SBI PO application form has been released on 2nd April 2019. Last date to fill the SBI PO Application Form is 22nd April 2019. The Application Form is available in the online mode. Candiates can fill application form or Pay the Application Fee only in the online mode. Candidates must need the recent passport size photograph and signature during filling the application form. The Application Fee for SC/ST/PWD candidates is INR 100/-. Candidates can pay the Application fee in Online Mode only. The application fee would be pay either from Credit/Debit Card or by the Internet Banking. Educational Qualification: Candidates must be graduate from the any recognized university, Students in Final Year/Semester of their Graduation provided they produce proof of having passed the graduation examination on or before 31.08.2018, Candidates with Integrated Dual Degree (IDD) certificate must ensure that the date of passing the IDD is on or before 01.07.2018. Candidates with Chartered Accountant certification may also apply. Age Limit: The candidate must be 21 Years to 30 Years as on 01.04.2018. For the SBI PO Examination Candidates age must be in between 21 to 30 years. candidates must have been born not later than 01.04.1998 and not earlier than 02.04.1989 (both days inclusive). Age relexation will be accourding to the Government of India. Here we discuss about the Exam Pattern for SBI PO. This is an online examination, in this the candidates must solve the 100 question in 1 hour for 100 marks. The test consists of 3 sections and candidates must clear the cut-off for each section. the SBI PO Main Exam has a total of 250 marks, consisting of an objective test of 200 marks followed by a descriptive test of 50 marks. Both the Objective and Descriptive Tests will be online. Candidates must answer Descriptive test by typing on the computer. Before preparing for any exam candidates must aware with the exam syllabus, Syllabus for SBI PO 2019 for prelims and for Mains is different, the prelims Exam will consists of 3 sections, Reasoning, Quantitative Aptitude and English Language. and the Mains section will consists of 2 additional sections. Check below the complete SBI PO 2019 Syllabus. The SBI PO Admit Card for pre will be released in April 2019, The State Bank of India will release the Admit Card for SBI PO 2019 only for those candidates whose application form will be accepted by examination authority. SBI will release the separate Admit Card for Preliminary and Mains exams, The preliminary exam is scheduled to be conducted tentatively in July 2019. The SBI PO admit card will be released in online mode only, therefore, candidates have to download it within the prescribed dates. Candidates can download SBI PO admit card candidates have to enter their registration number and password/date of birth. SBI PO Admit card/call letter of mains will be released only for those candidates who will qualify the preliminary exam. How to Download SBI PO Admit Card? Visit the official website of SBI. Click the Link SBI PO Admit Card. Enter Registration Number, Password and Capcha Code and Press Enter button. Candiates need to download and take a print out of the Admit Card. After the completion of the written examination, the SBI will release the result of each of the Exam on the official Website. Only appeared candidates will be able to get the examination scorecard. the authority will also release the seprate result for Pre and Mains examination. The Result for the Pre Examiantion will be released after the Few days of the prelims examination, and the result of the Mains examintion will be released on July 2019. Candidates can also check the scored obtained in the examination. How to Check SBI PO Result? Click the Link SBI PO Result. Aspirants need to know the syllabus of the exam, and make a proper strategy for each and every topic, candidates must know their strong and weak areas. Try to solve previous years papers. Need to know the exam pattern. Try to practice of Mock Test and make a proper analysis of the test.